Cradle Vista is a farm property on 22 hectares (54 acres) of grazing and cropping land. Cradle Vista is a top class spacious relaxing and welcoming non-smoking bed and breakfast accommodation home. 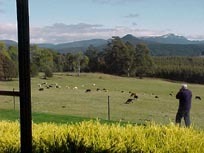 It is built in a rural setting where the views are truly magnificent, certainly among the best you will find in Tasmania. Cradle Vista is the place which will provide you with the best in accommodation and breakfast, a warm friendly environment and a superb locality for your day trips to Cradle Mountain, the West Coast, Launceston, Devonport, the North West Coast and many other easy drive local tourist attractions. Cradle Vista is where you may find prime beef cattle grazing in the paddock beside your bedroom, or young foals frolicking together in the field next to the driveway. Not to forget the platypus that can be seen from the house playing in the dam at the bottom of the paddock. Cradle Vista is a home surrounded by 3 acres of gardens. Over 40 varieties of Rhododendrons plus camellias and azaleas provide spectacular colour in the spring. Daffodils, tulips and many other flowering shrubs add to the display. Garden beds with conifers and a range of other plants make for interesting viewing throughout the year. 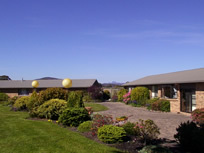 Cradle Vista is nestled under the triple peaks of Mt Roland, Mt van Dyke and Mt Claude to the east. 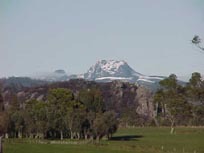 It is where you can see north to the coast and the sun reflecting off snow to the south on Cradle Mountain, then setting behind Black Bluff to the west. With outstanding hospitality in luxurious surroundings and an uncompromising commitment to guests' comfort from your hosts, this pristine environment is the perfect place to experience Tasmania at its best.